This is part one in a print series on Russia's unlikely football heros. Read part two, Igor Akinfeyev: Russian Football's Saving Grace, here. Until the 41st minute, it looked as if Russia was on its way out of the World Cup. A goal down and outclassed, the Russian players on Sunday could barely make it into the Spanish half, let alone carve out enough space for attempts on the goal. Then, after a freak handball by veteran Spanish defender Gerard Pique, the home side was awarded a penalty. 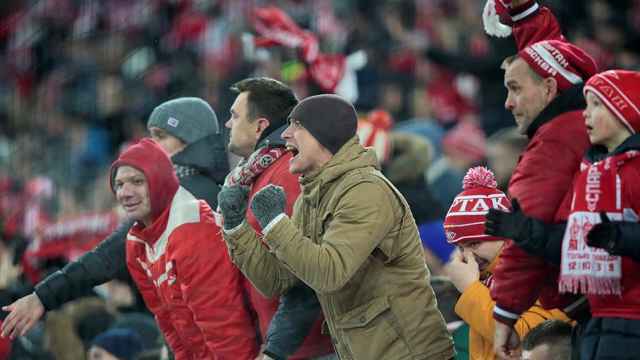 With 78,000 spectators on their feet and millions more glued to television screens, Russia’s lumbering striker, Artyom Dzyuba, coolly asked for the ball. First, he waited for the whistle. Then he slotted the ball into the back of the net. It was a decisive moment — the realization of what later turned out to be Russia’s only attempt at a goal in the entire game, which ended in a penalty shootout and a historic Russian victory. Even though he looked composed, Russia’s number 22 later admitted that he was terrified when he walked up to the ball. Born in a working-class neighborhood in Moscow in 1988 to a Ukrainian father who was a policeman and a Russian mother who worked in a grocery store, he is notorious for being one of the most outspoken players in Russian football. He left his boyhood club, Spartak Moscow, for archrivals Zenit St. Petersburg in 2015, in a salary dispute he characterized as a lack of respect for his dedication to the club. Dzyuba has managed to quarrel with coaches and fans of every club he has ever played for. Having once been one of the most promising products of the Spartak academy, Dzyuba’s career at the team was plagued by loan spells and constant conflicts with head coaches. After two successful seasons at Zenit, Dzyuba rose to become a star striker in the domestic league. However, one year before the start of the World Cup, his dream of performing for the national team was unexpectedly shattered. After a reported altercation with head coach Stanislav Cherchesov in May 2017, rumor had it he stormed out from Russia’s training ground. From there, it only got worse. Zenit’s new coach, Roberto Mancini, deemed the striker superfluous to requirements. The club’s top goal scorer of the previous season was suddenly demoted to the bench, after managing only two goals in 24 appearances. By winter, the striker was demoted to Zenit’s reserve squad, which plays in Russia’s second-tier league. Swallowing his pride, he asked Zenit for a loan to Arsenal Tula, a mid-table club with mid-table ambitions, all in the hopes of getting enough playing time to convince Cherchesov to let him back onto the side. Suddenly, Dzyuba flourished. He netted six goals in 10 games to become one of the best strikers of the spring. With the clock ticking down to the World Cup, the striker went on to issue a statement indicating he was ready to reconcile with Cherchesov for the sake of being called up. He got lucky. After another striker, Alexander Kokorin, was sidelined with an injury, Cherchesov welcomed Dzyuba back to Russia’s team. It may have been his best decision of the tournament. 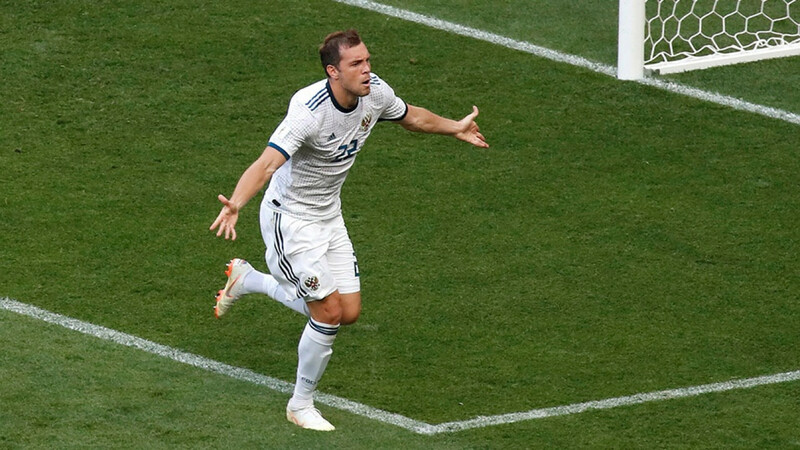 In Russia’s remarkable four-match run into the quarterfinals, Dzyuba has scored three goals. He is the homeside’s joint top scorer. More importantly, he is the player around which Russia’s remarkable team spirit is based. Russia’s fairytale progression into the quarterfinals, made possible by the striker’s decision to fight for a place on the team, has also seen his dour relationship with the head coach overhauled. Dzyuba now runs up to Cherchesov after scoring and gives an army-style salute, already a gesture he is famous for. “Cherchesov looks at him with a flurry of emotions. This is how a father welcomes his son after returning from the army. This is how a commander welcomes a fighter who has returned from a deadly mission,” the Sports.ru news website wrote about the celebration.